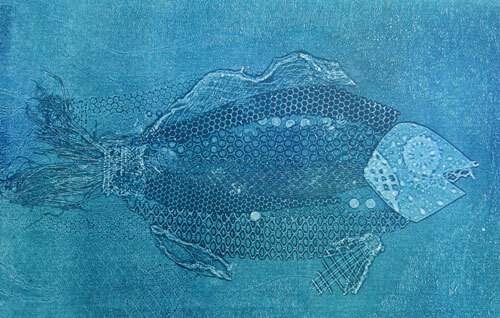 #200Fish is a community project to create works of art based on each of the species of fish found in the North Sea. The objective is to raise awareness of the biodiversity of the North Sea. There are about 200 species of fish native to the North Sea. This project is to record their existence through works of art. Mindful of the threats to the marine environment, global warming, ocean acidification, pollution, over-fishing and so on, we are inviting a large number of artists each to pick one of the fish species and produce a painting or other art-work therefrom. My fish is Fish #148 Black Seabream	Spondyliosoma cantharu.